Read the rest of the review at Developer Reading List | Dr Dobb’s. 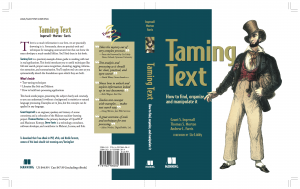 Inductive Bias » On Taming Text. Manning has informed us that the Taming Text eBook will be available this coming Monday, December 17th on the Manning website and the print Book (pBook) will be available on Dec. 31st. The book will be available on Amazon and Barnes and Noble a few weeks later. We are not sure what local stores the book will be in.